Sabja seeds are also known as Tulsi Seeds, Basil Seeds and Falooda Seeds; they are commonly used in the Indian subcontinent and nearby countries. Sabja seeds are quite similar to Chia Seeds, but they usually plump up into Tapioca form quicker than Chia Seeds. Sabja seeds or Falooda Seeds are dominantly used in sweet drinks especially during the summer season. If you have ever observed those plump looking translucent globules in your drink from Grandma, you’re absolutely spot on. These globules are good in taste, and they are full of nutrition too. They do not have much taste of their own, but they add a thick texture into the sweet drinks and add a new flavor of its own, making the drink really soothing and tasty, an absolutely perfect combination to quench your thirst in summer. Sabja Seeds are also termed as Sweet Basil Seeds, and their nutritional values are nearly same to that of Chia Seeds. The tiny black seeds are extracted from the dry pods of Basil Flower. 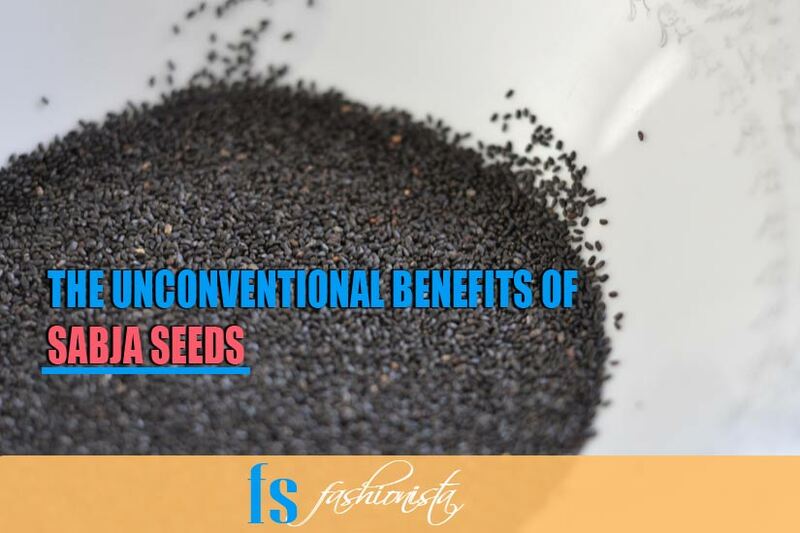 They also play a pivotal role in Ayurvedic and Chinese treatments for various diseases; they can also be interchangeably used in place of Chia seeds in any recipe. Sabja seeds constitute little carbohydrates and zero fat. A typical 5.3 grams of Sabja seeds serving contains 0.1 grams of dietary fiber, 0.2 grams of protein, 16 milligrams of potassium. As far as the vitamins are concerned the same serving contains 5% Vitamin-A, 1% Vitamin C and 1% of Iron from the daily values. Sabja seeds provide nutrition with fiber and an added texture that makes it not only good to taste but helps in digestion process a great deal. Sabja Seeds contain polyphenolic flavonoids that are known for their anti-oxidant properties. It can save your body from cellular damage due to the oxidation process. These seeds also possess anti-bacterial and anti-inflammatory properties; it is usually prescribed for gastro patients in Ayurveda and Chinese treatments to combat the infectious bacteria. These Falooda seeds are perfect for the athletes on a strict calorie diet because they are extremely low in calories and have no fats at all. These seeds present them with a proper mineral intake featuring Potassium, Copper, Manganese, Iron, and Vitamin C.
Sabja seeds are typically sold in their dried form; they are black in color with a hard and shiny texture. To use Sabja seeds soak them in lukewarm water for 5 to 10 minutes and let them get swollen into tapioca-like translucent form. You can use other liquids to achieve the same, but it is highly advised to soak them in water to help them into a complete plump translucent form. For two teaspoons of Sabja seeds, a full cup of water is good enough, you can also add some sugar in water to give them a good taste during the swelling process. There are numerous health and beauty benefits of Sabja Seeds; they are commonly utilized in many Chinese and Ayurvedic medicines to treat various health ailments. Sabja seeds or Falooda seeds offer excellent coolant properties. These seeds are generally consumed in summer season because it can decrease the overall heat of the body. Falooda is one of the famous desserts that not only tastes good but keeps the heat level to a minimum. Tulsi leaves are also used in summer as a hair mask to save the body from heat stroke. Sabja seed contributes as an essential ingredient of various Asian and Indian sweet drinks like Falooda, Limu Pani, Rooh Afza and even in smoothies. Sabja seeds not only decreases the level of heat in our body, but they also cure various digestive problems. You can chew the swollen plum seeds to fight the constipation, it will enhance the secretion of digestive enzymes in the stomach and eradicate the dryness in intestines. Sabja or Tulsi seeds can cure the acidity problem; you can consume the seeds directly or with a sweet drink to lessen the acidity. Ayurvedic treatments rely heavily on the consumption of Sabudana and Tulsi seeds to relieve the acidity pain. Not only that Sabja is an exquisite home remedy for ulcer patients, and use of Falooda seeds frequently can help in healing the infection quickly. A thick paste of Tulsi leaves can be applied over the stomach; it relieves the heat and stomachache by the external application. Sabja seeds are a perfect solution for the folks who are looking to lose weight with a calorie balanced diet. You can consume these seeds with Limu pani or any good pH balancing drink twice in a day to bolster the metabolism process. Sabja seeds can also decrease the level of triglycerides in the body which means little fat on the body. The best part about these seeds is that they swell into bigger pearls like shape and due to their fibrous structure they can curb your hunger to a good extent. So, if you are thinking about losing the weight make it a part of your daily routine. A drink with Falooda seeds before the meal can help a good deal to achieve your weight management goals. Sabja seeds can be helpful in controlling the blood sugar level; a diabetic patient can rely on its consumption along with the usual medicines. You can use the swollen form of seeds with a good pH balancing drink and maintain a healthy level of sugar in your blood. Doctors and Ayurveda experts recommend the consumption of Tulsi seeds to maintain an optimum level of sugar in the blood stream. Sabja can serve as a perfect alternative for Sago pearls due to its low fat and low sugar composition which is ideal for diabetic patients. Sabja seeds or Tulsi seeds are used in various Ayurvedic medicines to treat hypertension. These seeds have amazing cooling properties that work on the whole body. Tulsi leaves are also consumed to lower blood pressure; they are minty in taste and very effective for the cardiac system. For the patients with hypotension, it is strictly advised to consume a minimum amount of it. These seeds are a splendid organic option to cure respiratory tract infections and cold due to their great anti-inflammatory and anti-bacterial properties. You can consume raw Sabja seeds with an apple daily in the morning, and you would most likely be pleased with its result on your sore throat. You can also try a combination of Jaiphal and Sabja seeds, both of them have antioxidant and anti-inflammatory properties that can cure a cold within some time. Crush some Jaiphal cloves and raw Sabja seeds into powder form and consume them every six hours to cure a cold and sore throat. These seeds are also used in the treatment of Asthma, Fever, and Malaria. Limited researches have been conducted in India to testify its effect during the treatment of fever and malaria and the results were quite on the promising side. You can also try Basil seed tea by boiling one teaspoon of Basil seeds with a few leaves of Tulsi and a teaspoon of honey. This tea should be brewed for at least 10 minutes and should be given to Malaria, Cold and fever patients. Basil seeds or Sabja seeds are also used in the Ayurvedic treatment of stress. This seed is believed to improve the mood and suppress the stress from the human body. Basil seeds are also used to improve the menstrual cycles and Ayurveda treatment suggests the consumption of these seeds to the ladies with over delayed menstruation problem. Basil seeds are also prescribed to the patients with kidney stones and uric acid problems. These seeds decreases the burning sensation during urination for the kidney patients. Basil seeds are not only good for health issues; they are equally better for skin and hair. There are various masks involving Basil seeds for skin and hair that you can easily try at home. Tulsi leaves and seeds are a fabulous home remedy to treat various skin problems like psoriasis, dark spots, acne, and eczema. You can try different face masks with crushed Sabja seeds paste. People say I am obsessed with face masks, but these masks work better than any expensive creams from a fancy brand. Crush one teaspoon of Tulsi seeds and add a few drops of milk to make a thick paste. Now, add a crushed avocado and blend it with the thick paste. Make sure to add enough milk to create a thick paste and do not over do it. Use this mask on your face and let it rest for 20 to 30 minutes. Wash it off with cold water. This face mask improves the skin texture and enhances the skin glow. You can try this mask twice in a day. Avocados are one of my favorite fruits that are superb for your skin, do not forget to check this exclusive post on Avocado Face masks for various skin types. Aloe vera is an excellent remedy for various skin ailments, just crush a teaspoon of Sabja seeds and blend it well with fresh Aloe Vera gel. You can use a blender for this purpose; apply this mask on your face and let it rest for 15 to 20 minutes. You can also use this mask at night and wash it off early in the morning for better results. You can also add a few drops of honey in this mask. There is no question about the beauty benefits of Nutmeg (Jaiphal), you can make a thick paste of one teaspoon of Sabja seeds and two to three cloves of Jaiphal by crushing them and adding yogurt. Be careful with the addition of Jaiphal do not add more than three cloves because it may cause redness on your skin with burning sensation. You can use this mask once in a day, apply it on your face for 10 to 15 minutes and wash it off with lukewarm water. Chamomile tea is fabulous for your digestion, hair and skin, you can read about various health benefits of Chamomile Tea here. You can try several masks with Chamomile and other ingredients combination. Crush one teaspoon of Sabja seeds and add an equal amount of Chamomile Tea and two cloves of Jaiphal. Add a few drops of milk to create a thick paste and use it on your face for 30 minutes for optimum results. You can use this mask once in a day. This mask can increase the skin texture, fairness, and shine of the skin. The basil seeds can also contribute to hair growth, strengthening, and shine. You can try my personally tested basil seed hair mask and see its spectacular results within a few weeks of application. Crush half a cup of basil seeds and add two whole eggs, a quarter cup of mustard oil, two tablespoon lemon juice and half a cup of yogurt. Blend all the ingredients properly to make a thick paste, and you can also add two teaspoons of Jaiphal powder (optional) in it. Apply this mask on your hair for at least 30 minutes and wash it off with a good shampoo. The basil hair mask adds darkness and shine onto your hair, and it also enhances hair fiber strength. You can try this hair mask twice in a week, and I am pretty sure you would love to try it again after seeing its superb result. Furthermore, you can read my exclusive post on protein treatment hair masks and benefit from them too. Boil one teaspoon of Sabja seeds and add a few leaves of Tulsi in it. After brewing the water for 15 minutes, let it cool down. Wash your hair with the cold mixture. Sabja seed water is known to increase the length and strength of hair. It is also an ideal remedy for dandruff problem. The excessive usage of basil seeds can be troublesome during pregnancy as it is believed to reduce the estrogen levels but there is no scientific study available to support this notion.